The location of this villa is perfect and simply without question! Set close to Nissi Beach and the centre of Ayia Napa but not in a deserted town a couple of miles away. An ideal base for anyone attending a wedding on the east of the Island there are a mass of popular wedding hotels literally a stones throw away. Be it the Aeneas, Nissi Beach, Adams beach or Nissiana hotel - we're near to them all. If you have partying on your mind you can walk down Nissi Avenue (25mins) or get a taxi (5 mins) to the main "square", home to some of Europe's finest bars and nightclubs. Let's not forget that this villa comes with your very own private pool and gardens as well as a BBQ, air conditioning, TV and Playstation 2 as well as dining facilities (inside and out) for 6 people. We have three simple price bands with both our villas and this is based on 4 people sharing. A non refundable deposit of 25% payable by credit or debit card secures your required dates. Your holiday balance must be paid six weeks before you go. All payments are taken via Rentalsystems and a small booking fee applies. Along with your final balance you will be required to pay a security desposit which will be returned to your card around 10 days after you return to the UK as long as there are no problems with the property. 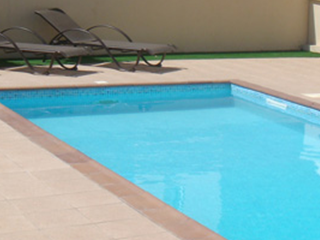 Our villas are cleaned and maintained throughly prior to your arrival by our local agents K-Paris. Upon request we can organise for a mid-stay clean which you can pay for locally.